When Do You See the “Red Flag” or “Invalid Title” Warning? Returns into his/her record to change the categories. Instead of assuming the authority to automatically delete aspects of the crew member’s record, such as a credit, we identify for you that that credit is no longer valid because the registrant has changed his/her mind on the categories under which he/she wants to be listed. Went back into his/her title and changed the category/subcategory under which he/she wanted to list. Failed to delete/remove that credit. So when you are logged in as user of the system, you as an Administrator, will see that “Invalid Title,” but the public logged onto your website will not see that credit (once it’s been approved) when viewing Skip’s record. 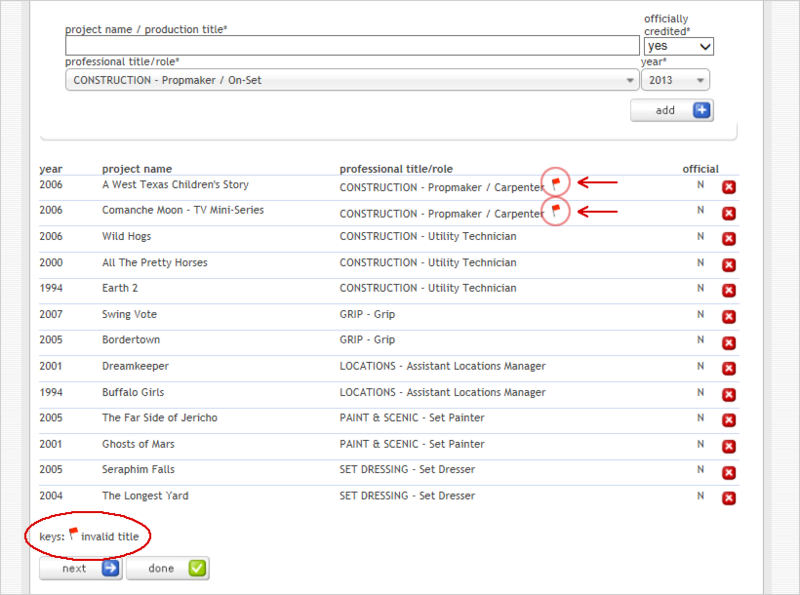 You can see he now has ‘CONSTRUCTION – Prop Maker / On-Set’ chosen as his category. How to Resolve the “Invalid Title” Flag? Delete the credits with unlisted categories from the profile entirely. We would recommend he lists these “less related” work experience in his full resume that he can upload but that the credits that need to be shown are ones for the category that he selects.